Heavy rain and freezing cold did not stop supporters of the Iranian Resistance, the NCRI and PMOI, in Canada to participate in a demonstration on Saturday, November 24, in Toronto and Ottawa and a number of other Canadian cities to declare their solidarity and support for Iran’s striking teachers, and Haft Tapeh Sugar Mill and Ahvaz Steel Workers who have been protesting for weeks against several months of unpaid wages and the mullahs’ plundering and destructive policies. In Toronto, freedom loving Iranians and NCRI supporters gathered in Mel Lastman Square on Yonge Street, to show their Solidarity and Support for Iran’s nationwide protests and strike by Haft Tappeh Sugarcane Workers who have started their fourth consecutive week of protest on Monday and Ahvaz Steel Workers’ 18 days of protests. The demonstrators are demanding the release of all detained workers and teachers who have been arrested following the recent peaceful demonstrations in Iran. Declaring their support for Iranian people in their legitimate demand for democratic change, the demonstrators are also calling for the release of all political prisoners in Iran. In Ottawa, supporters of Iranian Resistance gathered in front of the Parliament Hill, despite the freezing cold, to show their Support for #IranProtests and Solidarity with #IranNationwideStrike including the strike by Iranian teachers, farmers, and truck drivers. 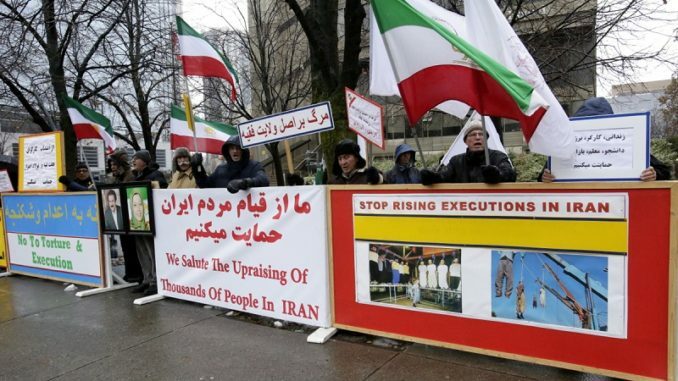 These demonstrations are held every week in Toronto, Ottawa and other Canadian cities.